Tara Devi Temple (4 K.M, Approx 10 min). Sankat Mochan Temple (7 K.M, Approx 15 min). Viceroy Regal lodge (12.5 K.M, Approx 30min). Himalayan Bird Park (12.5 K.M, Approx 30min). Shimla State Museum (12 K.M, Approx 30 min). Glen (15 K.M, Approx 40 min). Sri Guru Singh Sabha Gurudwara (13.8 K.M, Approx 40 Min). The Army Heritage Museum (13 K.M, Approx 30 min). The Ridge/The Mall/Lakkar bazaar (14 K.M, Approx 35 min). The Christ Church (14 K.M, Approx 35 min). St. Michael's Cathedral (14 Km, Approx 35 min). Johnnie's Wax Museum (14 K.M, Approx 45 min). Kalibari Temple (15 K.M, Approx 35 min). The Gorton Castle (13 K.M, Approx 30 min). Jakhoo Temple (19 K.M, Approx 40 min). Potters Hill (13.2 K.M, Approx 40 min). Prospect hill (11.5 Km, Approx 30 min). Mashobra (24 K.M, Approx 1.10 Hours). Kufri Famous tourist place (25 K.M, Approx 1.5 Hours). Green Valley Fagu (30 K.M, Approx 1.5 Hours). Shali Tibba Temple: (53 K.M Approx 2.5 hours). World’s highest cricket ground Chail (45 K.M, Approx 1.35 Hours). Naldehra (35 K.M, Approx 1.40 Hours). Sri Sathya Sai Baba Temple Pujarli (36 K. M, Approx 1.5 hours). Tattapani (65 K.M, Approx 2.5 Hours). Narkanda (75 K.M, Approx 2.50 Hours). Carigneno (25.5 K.M, Approx 1.30 Hours). 1.5 K.M from Shoghi Railway station . 1 K.M from Shoghi Bus stand . 200 Mt. from Rail Under Bridge (bus stop near Aamantran Stays). 09 K.M. from Shimla ISBT. (Approx 30 min). 11 K.M. from Shimla Railway Station. (Approx 30 min). 19 K.M. from Shimla Air Port. (Approx 40 min). 100 K.M. from Chandigarh. (Approx 4 hours).
" ** Pick and drop facilities available on prior request on chargeable basis. " While driving from Delhi to Shoghi, take the GT Karnal Road/NH 1 to drive out of Delhi, and then head towards NH 1..
After about 30 km, you will reach Murthal where you will find a number of Punjabi Dhabas. You May stop for some food and refreshments. You may also stop at Haveli for some hygienic food with some great ambience..
Continue straight for another 40 km till you cross through Panipat, a city renowned for its carpets, bed linen, and the popular ‘Pachranga achaar’ (pickle). Drive on for next 80 km, via Shahbad, before you arrive at Ambala, from where you have to take a slight left for NH 22. Follow signboards to drive straight on NH 22 for a while till you reach Zirakpur from where you have to follow NH 22 Kalka Road, passing by Chandigarh. Drive past Dharampur and Dagshai, respectively, a 23 km stretch. Cross Dharampur. You can take a halt for some refreshments. Continue on NH 22 and pass through barog/by pass road and solan. Remain on NH22 till you reach Shoghi Bazaar. Take a right turn on to Anandpur road/Tara Devi Temple road/ Shoghi Railway station road.. Reach The Rail Under Bridge. 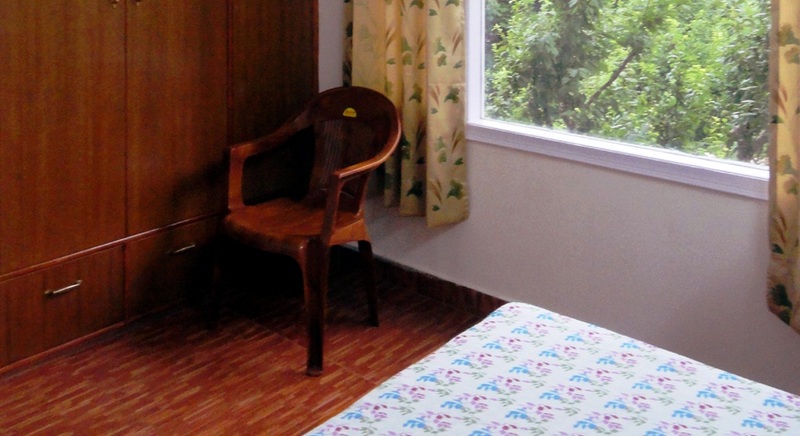 Take a right turn and take an uphill slope to reach Aamantran Stays. Shoghi is the prominent station between Kandaghat and Shimla. There are 24 hour bus services from Delhi and Chandigarh for Shimla taking the NH 22 which starts from Ambala passing through Zirakpur, Parwanoo , Dharampur, Barog, Solan and Waknaghat and goes up-to Khab near the China border. Delhi Shimla distance is 370 kilometres and travel time is approx 8 to 9 hours. A 10 km long four lane Pinjore bye pass has recently been constructed to avoid the bottlenecks and huge traffics on Kalka Shimla route. A large number of Volvo buses are available from Himachal Roadways and HPTDC. Both these Himachal govt. undertakings have online bus ticket booking facility also. Most of the Volvo bus timings are in the morning and evening. Ordinary buses are frequently available from Chandigarh ISBT (Sector 43)to Shimla at a gap of half an hour. You will have to get down at Shoghi bus stand 13 kilometres before Shimla. All ordinary buses stop at Shoghi bus stand located on the NH 22, and Volvo buses stop on request. Aamantran Stays is just a kilometre from this Shoghi bus stand and taxis are available at the bus stop or you can call us to arrange the same. 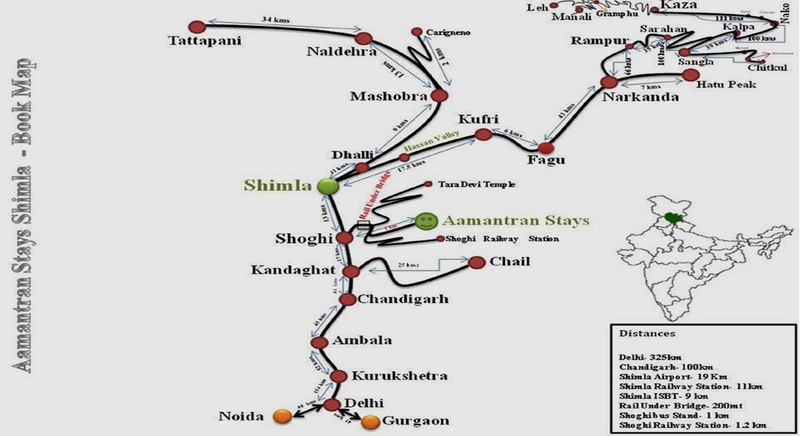 Kalka is the nearest broad gauge railhead and is the nearest railway station that connects Shimla to neighbouring States (70 Kms from Shoghi) and Shoghi is the nearest narrow gauge railway station. There are 102 operational tunnels en route with the longest being 1.2 kilometres long in Barog! It takes around 4.5 hours to reach Shoghi Railway station. You can also take a taxi from Kalka or alternately you can come by bus. From the station you have to climb down to Shoghi bus stand (about 100 meters) and take a taxi to Aamantran Stays. Narrow Gauge trains Himalayan Queen (Train No. 255) & Shivalik express (Train No. 241) does not have a stop at Shoghi Railway station while coming from Kalka. For your convenience we can arrange for a pick up for you from Tara Devi the nearest halt for Himalayan Queen (8 Kms after Shoghi) and Shimla the nearest halt for Shivalik Express (13 Kms from Shoghi). 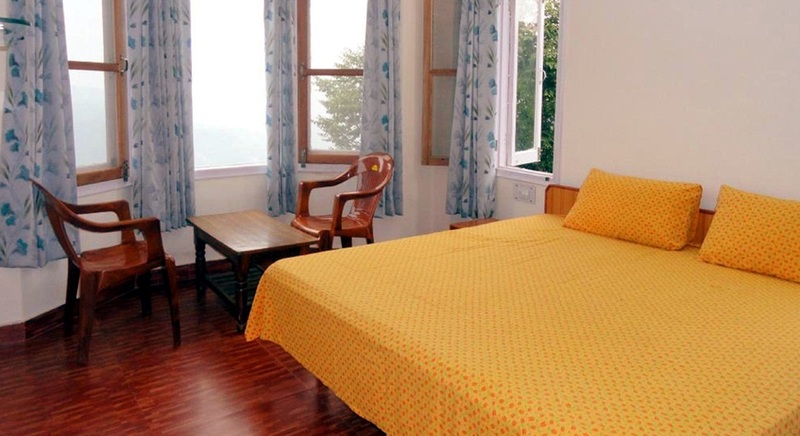 **Aamantran Stays is 1.5 kilometres from Shoghi Railway station . 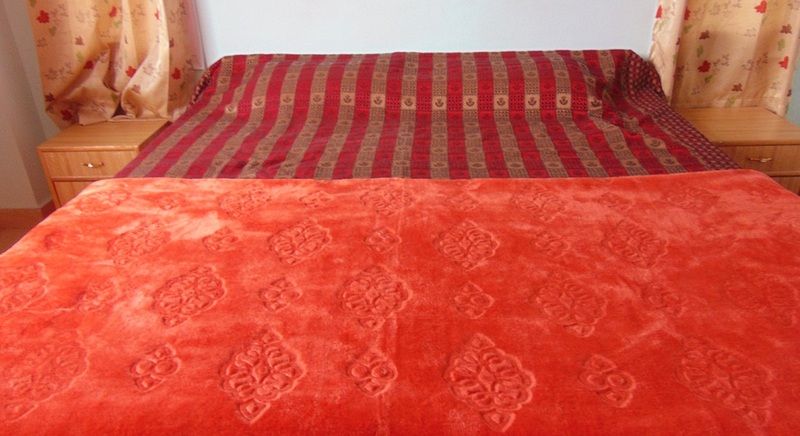 **If coming by Himalayan Queen Train the nearest station is the Tara Devi railway station . Ritz Cinema"Located at the ridge behind Christ Church." Shahi Theatre"Located near old Bus Stand." SRS Cinema"Located at" ISBT Tutikandi. " " Located on the mall road. It hosts visiting theatre companies as well as 15 local dramatic societies. It also showcases various art exhibitions. "